The lakes and lagoons that run along the Sapphire Coast are part of a dynamic environment that draws people to live in and visit the Bega Valley, but the natural workings of these water ways can present a challenge at times. Bega Valley Shire Council is aware of the frustrations being felt by Eden residents at the moment around Lake Curalo. 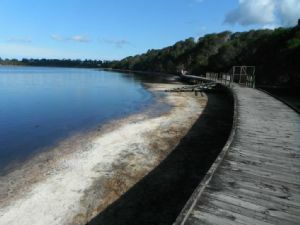 The extended dry period the region is currently experiencing has depleted water levels in many of the Shire’s coastal lakes and lagoons and in the case of Lake Curalo that has resulted in unpleasant odours and concern for the Lake’s overall health. “These environments really feel the extremes of our weather. During wet times they fill with water and threaten to flood surrounding properties, in dry times we experience the sort of conditions we are seeing now around Lake Curalo,” Council’s Environmental Management Coordinator, Daniel Murphy said. Known as Intermittently Closed and Open Lakes or Lagoons, or ICOLLs, these bodies of water open and close to the ocean naturally in a constant but irregular cycle. ICOLLs close to the ocean when waves and tides push sand from offshore into the entrance channel. Without further large freshwater flows into the estuary, the ICOLL will remain closed to the sea. When ICOLLs are closed they do not exchange water with the ocean and water levels within them fluctuate depending on rainfall, catchment inflows and evaporation. Due to a lack of rainfall and high temperatures, the water level in Lake Curalo has significantly dropped exposing weed and seagrass beds and mud flats to the sun triggering a natural occurrence of hydrogen sulphide or ‘rotten egg’ gas as it is more commonly known. “It has been suggested that Council needs to open up the lake to restore the tidal flushing,” Mr Murphy said. “Unfortunately that is not feasible, or possible, only time and good rain will ease the problem. “First and foremost, there needs to be sufficient water in the ICOLL for it to be opened successfully to the ocean. “It is important to understand how the hydraulics of an estuary works. Put simply, if the water level in the lake is not higher than that of the ocean, it is near impossible to achieve a successful lake opening. “Opening lakes or lagoons at low levels will almost certainly lead to an ineffective opening. It is also important to note that the higher the water level in the lake prior to opening, the longer the entrance will stay open to the ocean. “Experience has shown that if the lake is opened at a low level and without significant runoff coming from the catchment, there is a strong possibility even more water will drain out, further depleting the water level. “Without the force of a good body of water behind it, the mouth tends to closer over again pushed along by the more powerful actions of the sea,” Mr Murphy said. Council has a longstanding involvement in the management of Lake Curalo, and is currently reviewing the Curalo Estuary Management Plan. If you are interested in becoming involved in the plan, please refer to the project website, the community’s involvement and understanding is key. “I hope having a better sense of how these systems work helps concerned residents,” Mr Murphy said. People who artificially open the entrance to a lake or lagoon are liable to prosecution under the Fisheries Management Act 1994 and could face very serious penalties. For more information about opening ICOLLs refer to the Department of Primary Industries website. Photograph: The water level in Lake Curalo has been dropping steadily over summer.